Jack Kerouac ruined my life – or saved it. I’m still trying to figure that out. At the completely ignorant age of 18, Anoka-Ramsey Community College had the audacity to ask me what I’d like to study. I was 18. I didn’t like authority. I wanted to make money. I thought owning a business was a good career choice. No, 18-year-old Jeff. Wake up. The fact that I didn’t like any of my business classes didn’t tip me off. I really didn’t like many of my fellow students, either. The summer of 2000 I read On the Road by Jack Kerouac and my eyes finally opened. In the fall of that same year, I checked out The Dharma Bums from the UW-Stout library (it may have been the only one I ever did.) It was all over. I finished my business classes like a full, lonely man eating one more helping of dessert at The Old Country Buffet just to get his money’s worth. I took on a double minor of English writing and journalism and approached the classes like I was starving for information. It’s because of Jack Kerouac I have yet to establish a real career. It’s because of Jack Kerouac I’ve never had a lot of money. It’s because of Jack Kerouac I don’t care I haven’t established a career and have never had a lot of money and I enjoy my life and am a happy person. I’m not giving him all the responsibility, but outside of my parents, family and friends, he may have been the greatest influence on my personality. A dharma bum is a truth seeker. In The Dharma Bums Jack Kerouac, poet Gary Snyder (Japhy) and friends come together in cities and hiking in the mountains and simply talk about life and Buddhism. They also read books and poetry and do a lot of other beatnik activities that would make Bill O’Reilly throw up. They live off the minimum and do their best to eliminate as much suffering from their lives. I was recently sitting in a restaurant in Surin, sipping coffee and reading The Dharma Bums while waiting for my friend Christine to meet me when I realized, I am a dharma bum! The Dharma Bums got me interested in Buddhism. I am now surrounded by Buddhists. I have very few possessions, but I do have a lot of books (for a Peace Corps volunteer). Yes, it is 2011 and I have things like this computer, an iPod, digital camera and a Kindle. These things weren’t in Kerouac’s vocabulary in 1955. I also take pride in my lack of fashion, much to the chagrin of my girlfriend. When I’m not working, I have four identical Fruit of the Loom grey undershirts. They fit well. There are times I forget I’m doing something good for the world. I’m having fun talking broken Thai to my neighbors and they seem to be enjoying my presence in their community. I’m not hopping freight trains (yet), but I am bumming rides from neighbors and friends. The novel ends with Kerouac going to the peak of Mount Matterhorn in the Cascade Mountains of Washington to be a fire lookout. He’s all alone with nothing but his books and his thoughts. Sounds familiar. ... dreaming of becoming a dharma bum myself. 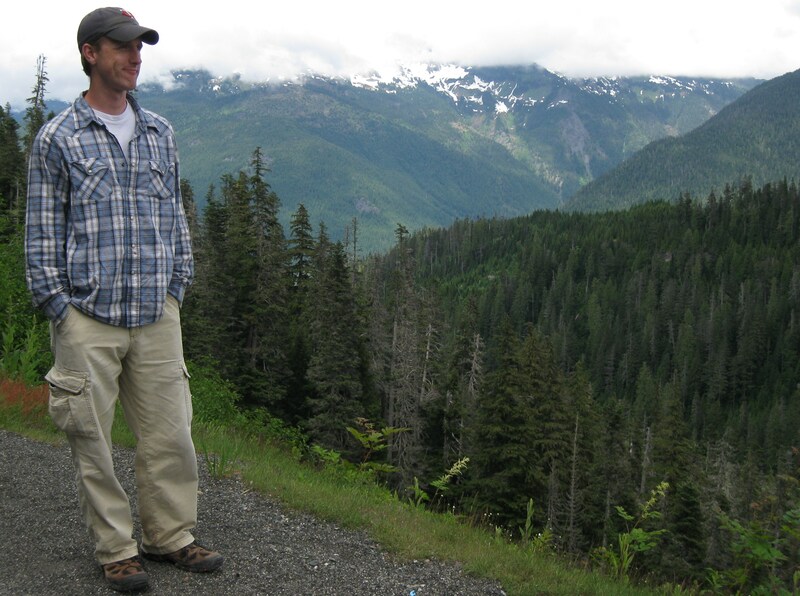 Taken the summer of 2009, near Mount Baker in northwest Washington, not far from Mount Matterhorn. 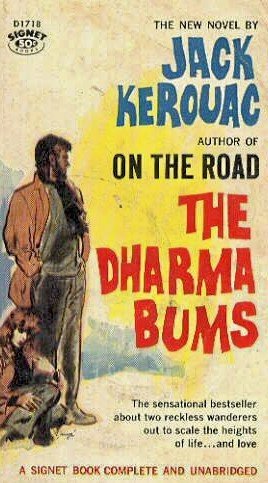 This entry was posted in Peace Corps and tagged jack kerouac, john lennon, on the road, the dharma bums by Jeff Jackson. Bookmark the permalink. I don’t throw out praise. Mostly I’m a snob about writing and music. And life. So it goes. Your writing is fantastic. I read it out loud to Morgan. It’s obvious that you spend time on what you publish, and I enjoy taking the time to read it. When you get back to the states, keep writing. I will read it. ‘I’m just sitting here watching the wheels go round and round…’ — You know who it is. You Lennon quote fits quite well in the PCV way of life.